Keep your favorite detailing products at your side at all times! Adjustable belt for waists up to 44"
If you are tired of the continuous picking up and putting down of various detailing products, throughout the various detailing steps, the Detailer's Helper Tool Belts will allow you to keep your favorite products at your side! With various pockets, you will be able to hold various size bottles of polish, cleaner, pads, your phone and so much more. No matter the manufacturer, you will find a pocket that works for you favorite detailing products. Each pocket is specifically designed to be paint-friendly with a soft cotton fabric construction. No metal, plastic, or harsh fabric has been used. This construction not only allows you to safely detail, without worrying about scratching your paint, but it will stand up to the various rigors of use for years to come. 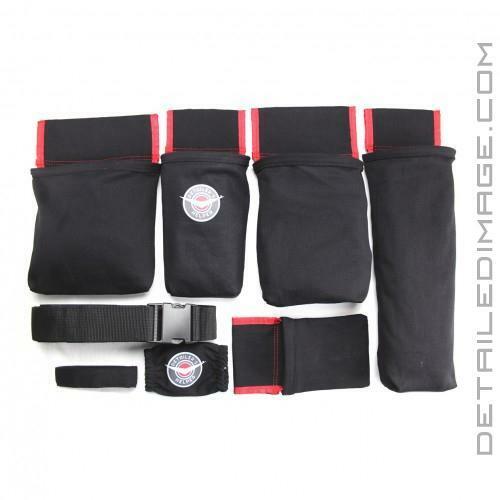 The HD Tool Belt features an adjustable belt for waists up to 44". There are no plastic or metal buckets used, so no worries about scratching the paint if you bump against it. Unlike the Standard Tool Belt or the HD Tool Belt, the HD Tool Belt features 5x unique pockets! With this belt, you will have a 16oz bottle bag, 32oz bottle bag, mobile phone/business card bag, polishing pad or large miscellaneous bag, and a reinforced deep polisher bag. The reinforced deep polisher bag is designed to fit most polishers on the market for a more hands free use. On top of all that, you get a beautiful red piping and accents that really set the belt off. If you are looking to save valuable effort and time when detailing, the Detailer's Helper Tool Belts are great! Use Detailer's Helper - Make an Extra $3250!